and going through the gauntlet of drivers holding out plaques without our name, after an exuberant number of phone calls to the company, who would hang up when it rang - never would I recommend this. In fact I would give it a zero, but it wouldn't accept it. When I finally got through - 15-20 minutes later a 'person' showed up with a piece of paper with my name scribbled in ink on it, when I asked him why he was so late, he never responded. Argh! I forgot how frustrated I was with this company and how horribly wrong it started out our wonderful 3 week vacation... DO NOT RECOMMEND! Driver was on time and courteous as per usual. For someone like us, arriving here without knowing anyone, this was a great thing to do, the driver had our names on a placard, and greeted us in the arrival hall of the airport, took our luggage and took us to the hotel. A few times I thought the driver was going to sleep driving on the way to the hotel, but thank good nothing happened. For on the way back, the driver arrived at the hotel exactly on time and took us back to the airport. Rome airport is a long way out of the city so this was the best way. 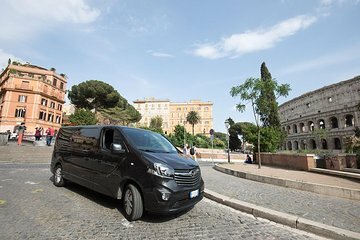 I always use the private transfer services from Viator when travelling as the prices are generally close to or better than the cruise ship pick up. We had the same driver for both the airport pick up and the hotel to ship transfer and I am sorry that I did not get his name, as he was exceptional. Very friendly and knowledgeable. The office person that answered the phone for a question was on the other hand rude and should stay away from phones. Short question, snarky answer. So he gets a one star. Only because he answered the question correctly. Excellent! Our driver was waiting for us when we landed. Helped carry our luggage to the car and got us to our hotel quickly without any problems! Worth the money. Our driver had to wait for do to a small snafu on our end. Only thing that would need to be changed is his friendliness. Our driver was more than happy to walk as quick as he could to his vehicle without a care as to were we were at. The company that runs this operation is professional and responsive so i would give them 5 stars of not for the one small change. Great driver!! Booked the pickup/1 hour tour. Our driver took us on an hour tour of the city and we got to see highlights of Rome! Thanks so much!! I was hesitant to book this but i am telling you they made it so easy for us. the manager mike called us a few times to alert us the status. driver was professional. really good experience. would highly recommend so you dont have to worry about transportation.